Color as adjective, verb, or noun; as key to image, mood, or insight; as code for perception fantasy-skewed or realist-bound. Inevitably, color-words populate poems and at heart, I think each should be taken to heart only according to and by its own lights. But what colors light up which poets’ minds? If, in aggregate, a poet’s appeal to color could be pictured, what strange self-portraits might emerge? We have our inklings, maybe—Sappho rose and gold-flecked, Plath splashed poppy red—but this is something different. Here, Reed Erlandson offers us an embodied foray, a careful experiment, a delightful lark. 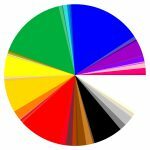 Meticulously collected and painstakingly sorted, here data makes music for and of the eye by translating into pie charts five poets’ use of color across their Complete Poems. What do color predilections—not even, accumulations—tell us about a person, or a place, or a time? 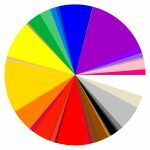 Is color dispositional? Contextual? If so, surely it best reveals our own. (Yes, of course, we might think, Frost is rather black and white. But how differently black registers making up a generous piece of Angelou’s pie. And it makes sense, doesn’t it, that Dickinson’s wheel would refract kaleidoscopic, while Yeats’ gives much over to gradients of grey?) What do these images bequeath or betray? A kind of portraiture, a sort of logic, a type of insight, a playful mash-up? Certainly, a good excuse to think about words in poems and the transubstantiations of photons into brainwaves and brainwaves into language while starting at something beautiful for part of an hour or a day. To the best of my knowledge, very little data-driven empirical research has been completed on poetry or even literature at large, especially as a survey inclusive of contemporary works. 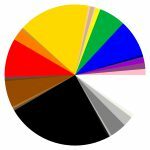 I began pursuing this project because I was interested in compiling and visualizing a body of analytics, and color seemed to be a fine starting point. I began by gathering as many collected poetry eBooks as I could get my hands on. I converted the works to TXT files and cleaned them up, removing dedications, indexes, tables of contents and other extraneous pages in order to keep my data pure. Next, I set out to find a comprehensive list of English color words. I started by parsing an exhaustive list of colors available online. After inputting this list of colors and their corresponding hexadecimal values into a TXT file, I removed duplicate entries and complex, technical compound words that would likely not be present in poetry (for example, “Deep Green-Cyan Turquoise”). 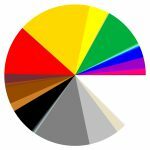 With a clean list of single-word color terms to compare against, I opened up a fresh TXT file and wrote a Python program for extracting accurate color data from the works I had prepared for data analysis. I ran the program and recorded the data it generated. A fair amount of manual labor and a bit of arbitrary decision-making was still required during this process; I had to check each individual use of a color descriptor that could also be used as a noun (for instance, “Peach,” “Chocolate”) and after examining its context, determine whether or not the word was being used to describe a color. After gathering all of my data and updating my spreadsheet, I wrote an ActionScript 3 program in Adobe Flash that visualized the data as interactive graphs. When I fed my first set of data into my ActionScript program and watched it output the first chart, my perspective on what I had created shifted dramatically. 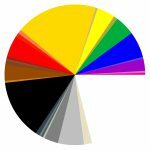 I’m no longer interested in gathering a large, comprehensive database of poetry color data—although the patterns and insights that one could mine from such a database are certainly intriguing, the visuals that my program produced are more interesting to me. I think that they are a striking glimpse into each poet’s soul, a proportional measure of personal ethos: Wallace Stevens’ wild riot of greens, blues and reds, Robert Frost’s muted range of browns, greys and golds, Maya Angelou’s flexile swatch of black and sapid browns, Yeats’ luminous slate of ash, onyx and silvered greys, and Emily Dickinson’s complex palette of flowers and shining gems. Reed Erlandson is a writer and game designer based in Seattle, WA. His poems have previously been featured in Echo Literary Magazine and Hothouse Literary Journal. He is also the curator-in-chief of SkeinCur.io, a collaborative, object-driven poetry project. He believes in perfect machines.